Returning For Valentine's by Victoria Pinder is a quick read, perfect for those with limited reading time. This is my first book by Victoria Pinder and frankly, I'm a little disappointed. 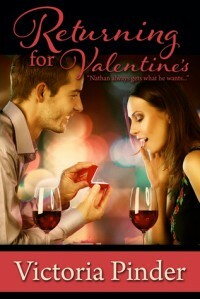 Beth and Nathan's story is full of drama, angst, spice and a bit of humor. It is choppy and disjointed though, not the smooth read I expected. I will reserve judgment though on Ms. Pinder's writing abilities and try one of her longer books. I've heard from authors that it's hard to write a book this short.